The “dolar blue” has hit record highs for the past two days following new rules from AFIP (the Argentine tax agency) that imposed additional fees on the use of Argentine credit cards as well as on travel packages purchased in Argentina for travel outside the country. First, AFIP raised the surcharge that Argentines must pay for using their credit cards abroad from 15% to 20%. This fee is applied to all purchase made in foreign currency, including Internet purchase. Then, they imposed a 20% tax on all travel purchases made in Argentina for travel abroad. This was designed to reduce the benefit of paying for your travel in pesos at the official rate while getting the blue market rate for your dollars (see example below). Argentine residents can get this 20% back when they file their tax returns. Initially it was reported that non-residents would no longer be able to buy travel packages or airfare for travel abroad in Argentina, but it seems that this has been changed to allow them to buy the packages with the same 20% surcharge. Supposedly this is a tax that you can get back when you file your foreign tax returns as well, though it is unlikely that most people will do this. 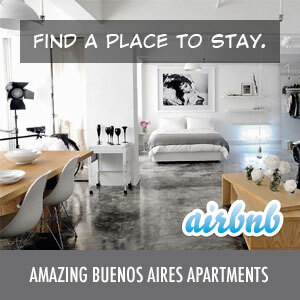 Let’s say you wanted to buy an airline ticket from Buenos Aires (EZE) to New York City (JFK). You go online and find that American Airlines is selling the ticket for U$S 1200. Now, you could buy that ticket on your non-Argentine credit card and you would pay U$S 1200. Simple. The benefit comes into play when you buy that ticket with your Argentine credit card or pay in pesos at the American Airlines office in Buenos Aires. They would convert that U$S 1200 ticket to pesos at the official rate – ARS $5.10 * U$S 1200 = ARS $6120. Now, assuming you were getting the pesos you needed to pay 3this at the blue market rate (ARS $8.00) rather than the official rate, you’d be getting that same ticket for only U$S 765 (ARS $6120 / ARS $8.00). Supposedly this was being over-exploited by Uruguayans and Chileans who were coming to Argentina specifically to purchase travel. This is why AFIP imposed the new 20$ fee – to make this less attractive. Yet, even with the new fee, buying that same ticket would be cheaper in Argentina than paying in dollars. Assume that U$S 1200 ticket has $100 in taxes (which you do not pay the 20% charge on), you’d now have to pay U$S 1420 for the ticket. That would be ARS $7242 at the official rate and U$S 875 at today’s blue market rate of ARS $8.27. That’s still a significant savings off the original U$S 1200 price. Note: The Xoom rate is currently only at $7.53 as it usually takes them a few days to catch up to major blue market changes.